The Chora Church was originally built as part of a monastery complex outside the walls of Constantinople, to the south of the Golden Horn. Literally translated, the church's full name was the Church of the Holy Saviour in the Country: although "The Church of the Holy Redeemer in the Fields" would be a more natural rendering of the name in English. (Greek ἡ Ἐκκλησία τοῦ Ἁγίου Σωτῆρος ἐν τῇ Χώρᾳ, hē Ekklēsia tou Hagiou Sōtēros en tēi Chōrai). The last part of that name, Chora, referring to its location originally outside of the walls, became the shortened name of the church. The original church on this site was built in the early 4th century, and stood outside of the 4th century walls of Constantine the Great. However, when Theodosius II built his formidable land walls in 413–414, the church became incorporated within the city's defences, but retained the name Chora. The name must have carried symbolic meaning, as the mosaics in the narthex describe Christ as the Land of the Living (ἡ Χώρα τῶν ζώντων, hē Chōra tōn zōntōn) and Mary, the Mother of Jesus, as the Container of the Uncontainable (ἡ Χώρα τοῦ Ἀχωρήτου, hē Chōra tou Achōrētou). The majority of the fabric of the current building dates from 1077–1081, when Maria Dukaina, the mother-in-law of Alexius I Comnenus, rebuilt the Chora Church as an inscribed cross or quincunx: a popular architectural style of the time. Early in the 12th century, the church suffered a partial collapse, perhaps due to an earthquake. The church was rebuilt by Isaac Comnenus, Alexius's third son. However, it was only after the third phase of building, two centuries after, that the church as it stands today was completed. 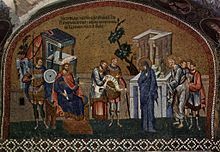 The powerful Byzantine statesman Theodore Metochites endowed the church with many of its fine mosaics and frescos. Theodore's impressive decoration of the interior was carried out between 1315 and 1321. The mosaic-work is the finest example of the Palaeologian Renaissance. The artists remain unknown. In 1328, Theodore was sent into exile by the usurper Andronicus III Palaeologus. However, he was allowed to return to the city two years later, and lived out the last two years of his life as a monk in his Chora Church. In the late 13th and early 14th centuries, the monastery was home to the scholar Maximus Planudes, who was responsible for the restoration and reintroduction of Ptolemy's Geography to the Byzantines and, ultimately, to Renaissance Italy. During the last siege of Constantinople in 1453, the Icon of the Theotokos Hodegetria, considered the protector of the City, was brought to Chora in order to assist the defenders against the assault of the Ottomans. In 1948, Americans Thomas Whittemore and Paul A. Underwood, from the Byzantine Institute of America and the Dumbarton Oaks Center for Byzantine Studies, sponsored a restoration program. From that time on, the building ceased to be a functioning mosque. In 1958, it was opened to the public as a museum — Kariye Müzesi. The Chora Church is not as large as some of the other surviving Byzantine churches of Istanbul (it covers 742.5 m²) but it is unique among them, because of its almost completely still extant internal decoration. The building divides into three main areas: the entrance hall or narthex, the main body of the church or naos, and the side chapel or parecclesion. The building has six domes: two in the esonarthex, one in the parecclesion and three in the naos. The mosaic in the lunette over the doorway to the esonarthex portrays Christ as “The Land of the Living”. The esonarthex (or inner narthex) is similar to the exonarthex, running parallel to it. Like the exonarthex, the esonarthex is 4 m wide, but it is slightly shorter, 18 m long. Its central, eastern door opens into the naos, whilst another door, at the southern end of the esonarthex opens into the rectangular ante-chamber of the parecclesion. At its northern end, a door from the esonarthex leads into a broad west-east corridor that runs along the northern side of the naos and into the prothesis. The esonarthex has two domes. The smaller is above the entrance to the northern corridor; the larger is midway between the entrances into the naos and the pareclession. Theodokos, the Virgin Mary with child. The Virgin and child, painted dome of the parecclesion of Chora Church. ^ and therefore sometimes incorrectly referred to as "Saint Saviour"
Van Millingen, Alexander (1912). Byzantine Churches in Constantinople. London: MacMillan & Co.
Ousterhout, Robert (2002). The Art of the Kariye Camii. London-Istanbul: Scala. ISBN 975-6899-76-X. Ousterhout, Robert G. (1988). The Architecture of the Kariye Camii in Istanbul. Dumbarton Oaks Research Library and Collection. ISBN 978-0-88402-165-0. Wikimedia Commons has media related to Kariye Museum.